I bought this excellent shot off Ebay recently. 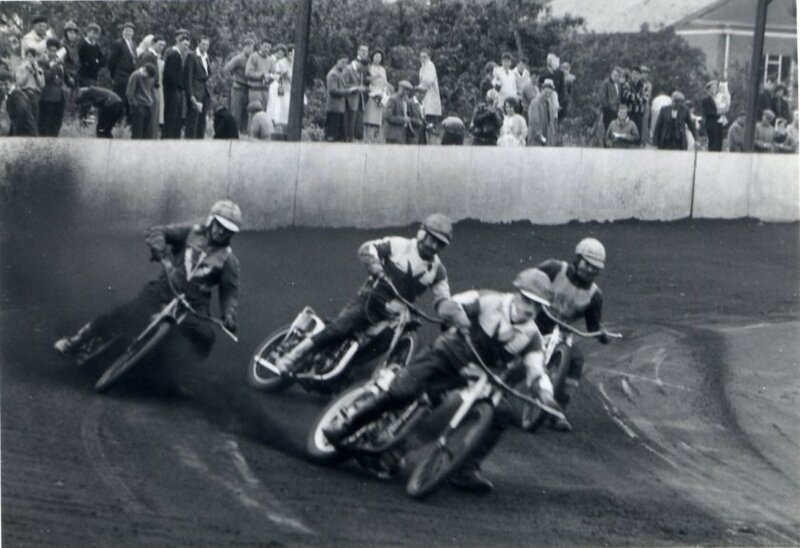 It was taken on 9th July 1962 but it could have been any time - Exeter never changed from our first visit which was in 1961 until the track closed after the 2005 season. We had few successes on the big circuit on which the home team were almost always dominant - we won in 1966, drew in 1987 and had a famous big win in 1995. Usually we were hammered. Another interesting thing about this photo is that Jimmy Cox is riding - he didn't often ride away matches in the sixties, he was always working to save up for better equipment. He hasn't got a proper race jacket on, he is using the thistle jacket often seen in individual events. Jimmy is on the outside with Willie Templeton inside. The home men in their smart green and white outfits are Gordon Bailey (a Scot) in front and veteran Howdy Byford behind. We lost a 5-1 and the match.